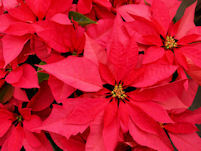 Poinsettia (euphorbia pulcherrima) is the most well-known potted Christmas plant used for gift-giving and decorating the home. 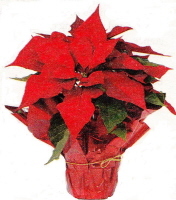 There are new varieties which come in white, pink, yellow, lime green or bi-colors; however, the bright red is the traditional holiday plant for conveying seasonal goodwill. It is a tropical plant that originated in Mexico and was named after Joel Roberts Poinsett, first United States Ambassador to Mexico in the 1820s. The new cultivars of today are long-lasting and continue to provide color after the holidays. The plant petals look like flowers but are actually groups of colored leaves called bracts. The real flowers are small, green or yellow and inconspicuous. These beautiful, blooming plants are an easy, stress-free way to add color and Christmas cheer to spread the merriment throughout your home. You can easily move these potted plants around to achieve that festive look as long as they are away from hot or cold drafts. Never place your plant on top of a television, near a fireplace, air duct, or door opening to the outside. This is necessary to prevent leaf drop. 1. The leaves should be green and healthy with no withering leaves at the bottom. 2. Make sure there and no more than two tiny yellow-green buttons in the center of the bracts open. These little buttons become flowers. If they are already open when you purchase them, they will soon fade. 3. Make sure the bracts are large and extend over the lower green foliage. Light: The plant likes bright light, so keep near a southern or southeast window for at least six hours a day. Watering: Water thoroughly so that the water runs out of the bottom into a saucer, empty the excess water and let the soil dry out slightly before the next watering, this is necessary to prevent root rot. Fertilizer: Not needed while blooming. Apply a balanced fertilizer when blooming is over to maintain healthy foliage and promote new growth. Temperature: Maintain the temperature of the location at 65 to 70 degrees F during the daytime and no lower than 50 degrees F at night. Humidity: Mist frequently while in blooms. You get your plant to bloom by light control. Beginning the first of October, protect the plants from light by placing them in a dark closet. You can also cover them with a large box or opaque plastic bag. Do this from 5:00 PM to 8:00 AM continuously for eight weeks. Exposure to even the tiniest bit of artificial light during this time can prevent the plant from re-flowering. After 40 days of this treatment, your festive gift plant can be kept in a room with regular light and you should have a flowering poinsettia in time for the Christmas season.